A new Coast to Coast guide book has recently been released. As one of the world’s most popular long distance walks, this route isn’t short of guide books, so I was a little concerned that this may be just another ‘me too’ book. My concern was somewhat ameliorated by the authors of the book; Tony & Chris Grogan who have, what a cockney wide-boy would call ‘form’ for writing excellent guide books (you can find their Dales High Way guide on Amazon and elsewhere). The book is a little bigger than I would expect for a guide which you’re going to have in your hand or in your pocket all day. At A5 it isn’t easily going to fit into a chest pocket – but having said that, you should make room for it somewhere, because it really is excellent! 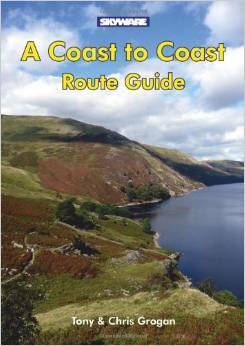 The book is titled ‘A Coast to Coast Route Guide’ and it does pretty much exactly what it says on the cover. There’s no accommodation information in here, no tips on walking at the best time of year, no weather information, no transport links; just the route.. in minute detail.. just as you would need for some sections of this walk. There is some background to the walk though, a little bit about Wainwright and how the walk has changed, but by page 8 we’re into the walk. I particularly like the fact that this walk is broken into the original 12 stages defined by Wainwright; this makes it perfect for a fortnight’s holiday. Each section starts with an overview map of the day and the following pages are covered with annotated full-colour maps in superb detail. These aren’t as detailed as the Trailblazer maps and the annotation isn’t as verbose either, but it’s much better than the usual OS 25k scale map with a yellow line on it. The maps use colour coding to display the height of the terrain and they’re accompanied by colour photos of the areas you’ll pass through on the day. You’d be hard-pressed to get lost using this book. The only slight niggle I have with the mapping is that north is rarely where you’d expect to find it. The maps are aligned to make full use of the space available and as such I found I needed to spin the book to keep north upwards, but then the text was side-ways on. It’s a compromise of space and functionality, but it’s a minor point and shouldn’t deter you from buying this excellent guide book. Available from the publisher here. I was sent the guide book to review by the author, but the review content is my opinion and text. From what you say here, this doesn’t sound like my kind of guidebook. Surely anyone walking (or thinking of walking) a particular route is going to want, or hope, to discover things for themselves, not be handheld through the entire long-distance route in minute detail? Just seems a bit overkill for a route that’s signposted throughout, anyway! The great thing about the C2C is that there are so many guide books, there’s probably one for every different set of requirements or tastes out there. Not walked the path since 2011 and that was East to West, but I don’t remember it being particularly well signed, except in certain places. You certainly wouldn’t get lost if you followed this guide properly, but as you say that’s not what everyone needs. It does fit a niche though I think.